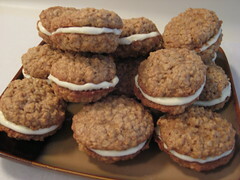 When I came across this recipe, I was hoping they would be like the Little Debbie Oatmeal Creme Pies. Sadly, they’re not. And they’re just OK, definitely nothing special. The cookie is sort of blah and the icing is way too sweet–and I’m someone who loves all things sweet. I’m going to bring them into the office tomorrow so I’ll you know what my guinea pigs say. Update: Huge hit with the coworkers. Maybe I’m just picky. Heat oven to 350 F. Grease baking sheets. For cookies, combine shortening, brown sugar, milk, egg and vanilla in large bowl. Beat at medium speed of electric mixer until well blended. Combine oats, flour, baking soda, and salt. Mix into creamed mixture at low speed just until blended. Drop rounded measuring tablespoonfuls of dough 2 inches apart onto prepared baking sheets. Bake one sheet at a time at 350 for 0 to 12 minutes or until lightly browned. Do not overbake. Cool 2 minutes on baking sheet. Remove cookies to foil to cool completely. For frosting, combine confectioner’s sugar, shortening, and vanilla in medium bowl. Beat at low speed, adding enough milk for good spreading consistency. Spread on bottoms of half the cookies. Top with remaining cookies. Makes about 16 sandwich cookies. I ended up with more than 16 sandwiches since I used a smaller cookie scoop. I flattened the tops of the cookies after scooping them, in an attempt to get a flatter cookie. Wow, look at all that crisco–and in the filling no less. Apart from th sweetness, did they taste light since no butter? I bet you could go for a more traditional oatmeal cookie (no milk or quick cook oats) and could get away with the sweet filling. But if the coworkers approve, yay! They look good. I think these types of cookies get better after a day or so. Maybe you’ll change your mind. ha ha. i would totally make a recipe if i thought it would turn out like the little debbie oatmeal creme pies, too! i love those things way too much. Brian, the cookie itself wasn’t sweet at all…just the filling! Paula, they were gone by day two, so I guess they were a hit with the coworkers! Rebecca, I’m still on the hunt for ones that will turn out like the Little Debbies! I had an oatmeal sandwich cookie yesterday and today (because I dreamed of it last night) at a catering cafe in Salisbury, NC. They wouldn’t give out the recipe, but a coworker (Ginny) said she makes them, another coworker I ate lunch with said Ginny’s were just like the ones at the restaurant, and Ginny said she’ll give me the recipe Monday. I’ll let you know if they turn out. This cookie makes Little Debbies look like bush league dreck. I nit-pickingly followed the recipe. My cookies spread out flat like crepes, so they didn’t look like the picture. They also weren’t as good as the ones I wrote about from the restauratn. Having said that, they were pretty darn good. My Sunday school class loved them. One tip: don’t use too much icing. Use a thin coat, just enough to stick the cookies together. That’s a gracious plenty ’cause it’s so sweet. I’d make this again, but I want to try Ginny’s recipe. I’m looking forward to trying the “catering Ginny’s” recipe. I could eat Little Debbie’s until the cows come home. For Ginny’s recipe to better than them will really amaze me!! !